Our recent trip to Singapore is all about my little daughter but we still managed to squeeze in some shopping time. I bought a little something for myself... a Swarovski Stardust Bracelet. 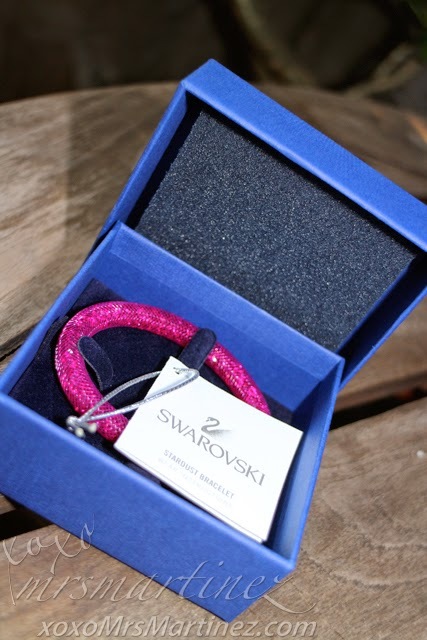 Swarovski Singapore only carries 5 colors- Blue, Black, Gray, Vintage Rose and Fuchsia. 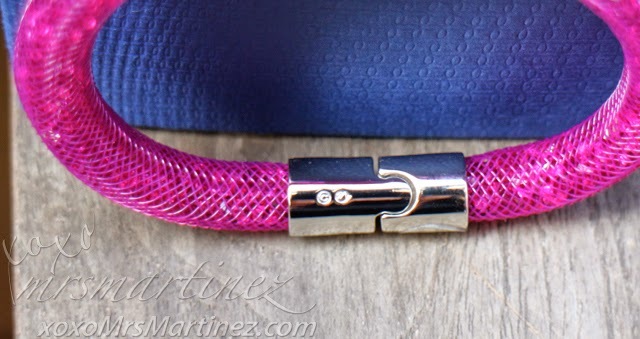 I chose the color fuchsia because it complements the everyday bracelets that I am wearing. 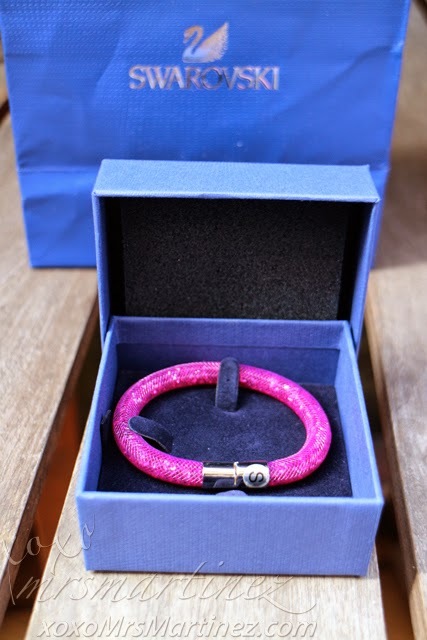 Swarovski boutiques here in Manila sells Stardust bracelet for PhP 6,250. A 10% discount will be given if you have a Rustan's Discount Card or if you pay in cash in all its stand alone branches. The price comes down to just PhP 5,625. When you open the box, you can find Stardust Bracelet Wear Instructions. The magnetic closure can be tricky to open and close if you are not familiar with the bracelet. 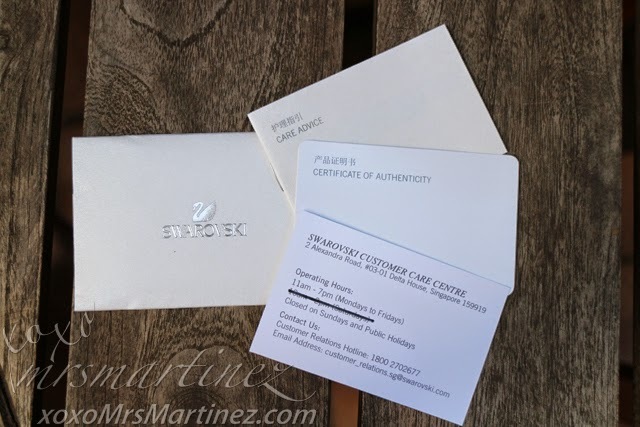 The word "Swarovski" was embossed on one side of the magnetic closure. The other side bears a copyright symbol and Swan logo. 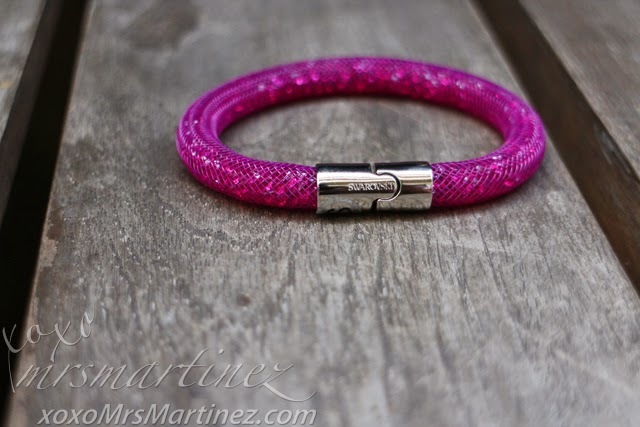 Swarovski Stardust Bracelet (Article n. 5102558) features a fuchsia nylon fishnet tube filled with tiny fuchsia-colored crystals. The easy-to-use magnetic closure shines in palladium-plated metal. It is available in two sizes- Small (7 inches) and Medium ( 7 3/4 inches). In the US, Swarovski Stardust bracelet costs $60 (shipping not included) and it comes in 10 colors- 2 variations of Light, Fuchsia, 2 variations of Gradient, Vintage Rose, Black, 2 variations of Gray and Blue. Also available in Stardust Double Bracelet for only $80. Swarovski is located at the Ground Level Takashimaya Singapore 319A Orchard Road Singapore.